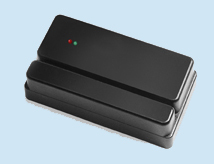 RF reader with optional barcode and magnetic stripe. Supports IBC, Hid, Farpointe,Awid, Casi, Indala, EM prox, Iclass, Mifare, and PIV-II smartcards. The Smart Prox Jx is a decoded RF reader available with proximity, Mifare, Iclass, and/or barcode and magnetic stripe. They can be used anywhere where the reading of both barcodes, magnetic stripes, and rf cards are required, such as visitor systems, security systems, time & attendance systems, hospitals, and college campuses. These readers are available in many different industry standard interfaces, are programmable, and are available with a variety of options, such as leds, relays, and door sense inputs. The Smart Prox Jx will read all hi and lo-co magstripes, at any density, most barcode symbologies, proximity cards by Hid, Farpointe, IBC, Casi, Awid, Indala, and Iclass,Mifare, and PIV-II 13mhz cards. Proximity formats can also be modified using this reader. For example, 26 bit proximity cards can be read and then reformatted into 34 bit outputs. Perfect for use in Access Control and Time & Attendance applications, and any application where the primary card technology is proximity, but temporary badges are made using barcodes or magstripes. The Smart Prox Jx is available as a combination reader, with internal proximity/rf reading, as a 1-piece prox/rf-only reader, or as a 2-piece solution, using an external read head for the proximity/rf reading. This 2-piece solution allows proximity readers with either wiegand or aba output to also use the complete functionality of IBC's "JX" series readers, such as computer control, and relay activation.Â Any application which currently uses "JX" series readers using barcode or magstripe can add proximity support using any model or configuration of the Smart Prox JX. The Smart Prox Jx is firmware upgradeable, and can both read and process Kronos, Cac, Usid, and Dbids barcodes.